Solving breastfeeding mysteries has always been a passion for Lisa, who is known for her inquisitiveness and tenacity. Her specialization in milk production was born when, after a resurgence in scheduled feeding began to sabotage unwitting mother’s milk supplies, she discovered that there was no comprehensive, referenced source to explain milk production to parents. The process of researching and writing such a document laid the foundation upon which her later work was built. Lisa also personally experienced a mysterious loss of milk supply with her fourth child, the cause of which only became clear to her years later as her research into milk production issues deepened. As a result of her own experience, she has great empathy for her clients and a renewed desire to understand the mysterious and difficult. This led to her eventual master’s thesis on Polycystic Ovary Syndrome and its possible relationship to milk production problems, and other clinical situations have led to new areas of research. A born teacher, Lisa enjoys sharing what she has learned as much as the process itself. Her passion for her topics comes through clearly in her dynamic presentations, and she takes a personal interest in answering the needs and questions of any and all attendees. It is her desire that attendees not only go home with “what to do’s,” but more importantly, have a deeper understanding of the topics so that they can think through the unique situations that they face and develop better strategies targeted to the problems. Lisa Marasco has been working with breastfeeding mothers for over 30 years and has been Internationally Board Certified since 1993. She holds a Master’s degree in Human Development with specialization in Lactation Consulting and was designated a Fellow of ILCA in 2009. 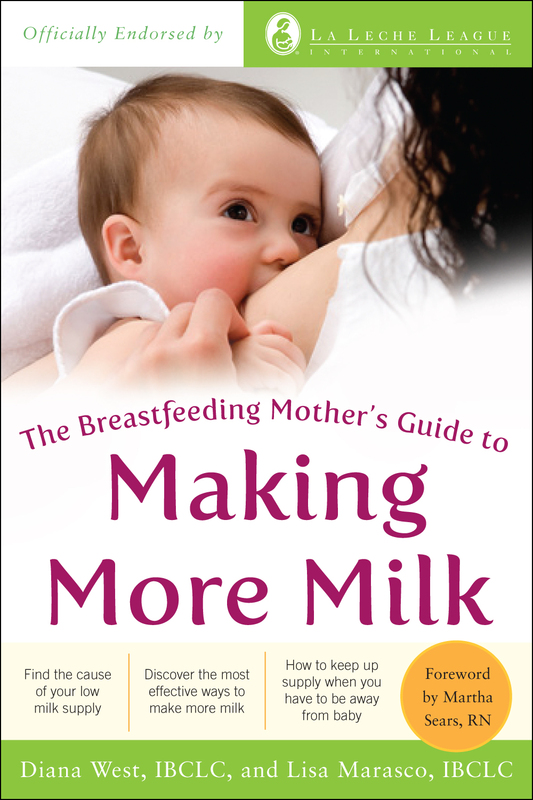 Lisa is co-author of The Breastfeeding Mother’s Guide to Making More Milk, a contributing author to the Core Curriculum for Interdisciplinary Lactation Care, and a new Cochrane Collaborative author. She is employed by WIC of Santa Barbara County while she continues to research, write and speak. In addition, Lisa is an Associate Area Professional Liaison for La Leche League of So. Calif/Nevada, and serves on the Breastfeeding Coalition of Santa Barbara County. Lisa Marasco has been working with breastfeeding mothers for over 30 years . 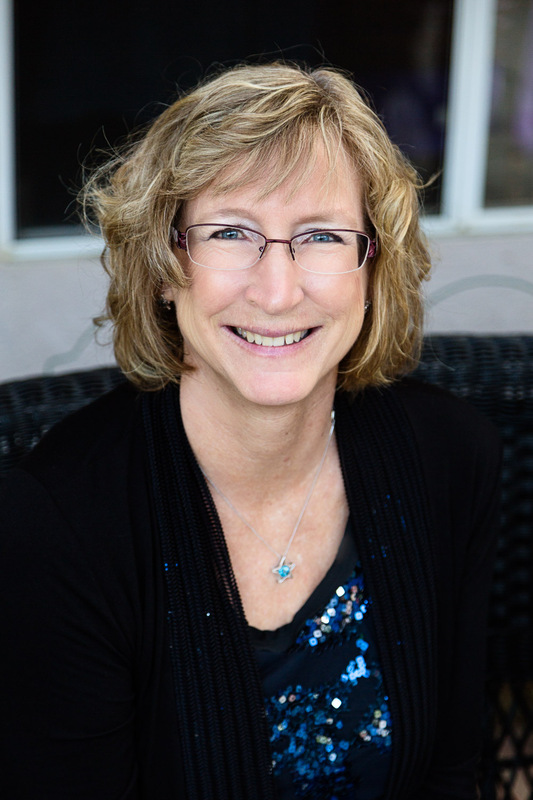 Originally an accountant, Lisa fell in love with breastfeeding her own children and decided to change her career path, first by becoming a La Leche League Leader and then later pursuing a Master’s degree in Human Lactation with specialization in Lactation, becoming an IBCLC in 1993. 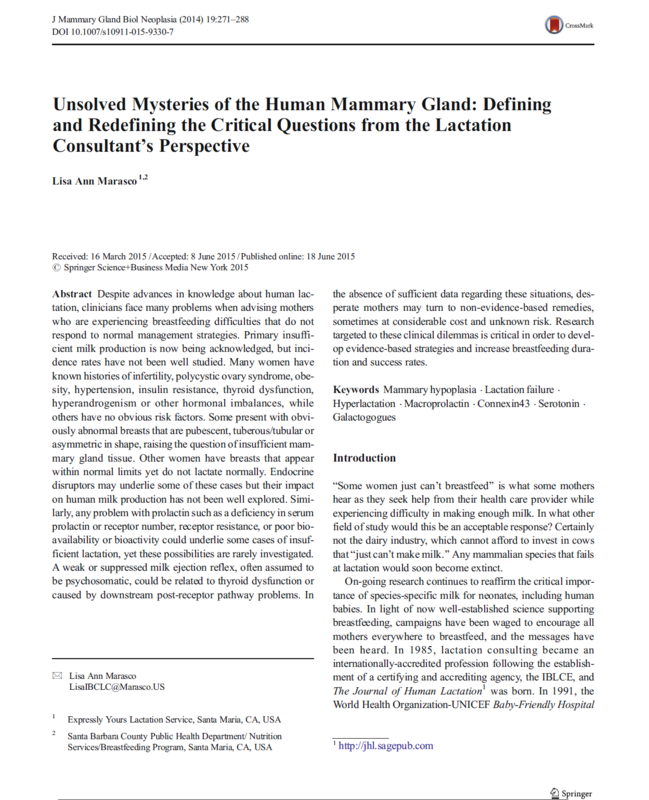 Her thesis on Polycystic Ovary Syndrome and breastfeeding was the first to investigate infertility and hormonal-related causes of insufficient milk production, and has since spawned new inquiries into other hormonal connections. Driven by a passion to help her clients, Lisa has researched many challenging situations and shared her discoveries in articles, conferences, online support groups, and through co-authoring The Breastfeeding Mother’s Guide to Making More Milk as well as the chapter on Low Milk Production and Infant Weight in the Core Curriculum for Interdisciplinary Lactation Care. Her most recent projects included a seminal article on Unsolved Mysteries of the Human Mammary Gland and a Cochrane Review of oral galactogogues. In recognition of her contributions, Lisa was designated a Fellow of ILCA in 2009, and in 2018 received the USLCA Award of Excellence for her research work. She resides in Santa Maria, California and currently works as an IBCLC for the Santa Barbara County Public Health Department Nutrition Services/ WIC. Lisa and her husband Tom have 4 grown children and 7 grandchildren, all proudly breastfed. Insulin is part of the Lactogenic Complex and Lactogenesis 2 cannot start without it. Until recently, however, we did not understand its role well. Emerging research is starting to shed light on specific roles for insulin in both pregnancy breast development as well as milk synthesis. Discover the how and why diabetes and insulin resistance can cause lactation problems, and what treatments may be helpful for affected mothers. We all have those mothers who just seem to get the best of us, and we aren’t always sure why or what to do about it. This session discusses who the high need mother is, including situational issues and the impact of personality disorders on the helping relationship. Appropriate boundary setting and proactive strategies are discussed to help cope more successfully with these challenges. This session was originally co-developed in conjunction with my colleague Nancy Williams, IBCLC, MFT. It usually generates a lot of discussion in the audience; more time would allow for more discussion. When good management isn’t good enough to improve low milk supply, what else could it be? Hormones play important roles in lactation and when they aren’t working right, lactation may be affected. Conditions such as thyroid dysfunction, diabetes, prolactin problems and polycystic ovary syndrome affect lactation for some mothers. This session discusses how hormones work, what kinds of things can go wrong, identifying problems and developing treatment strategies. The amount of foundational information before the specific conditions depends upon other sessions selected and time allotment. “What can I say?” When it comes to complementary and alternative therapies, many lactation consultants are unsure of how to conduct this conversation with a client. We will take a look at our professional guidelines, the question of evidence, and handling real-life dilemmas that come up. This is an E-CERP talk. Herbal galactogogues- substances that boost milk production– are often looked upon suspiciously by those who are not familiar with them. But when a client is already doing her best and prescription galactogogues don’t fit well into the picture, what else can be done? Parents increasingly ask about herbs, but many LCs and health care providers have little knowledge and feel uncomfortable when asked to provide guidance. This session will familiarize the learner with important herb issues then examine individual profiles, research and clinical experience for some of the most popular reputed galactogogue herbs and products. This session starts with an overview primer on herbs in general, reviews potential galactogogue mechanisms, and then examines specific herbs. The talk is customizable and designed to be audience driven after the overview so that we can focus on the herbs and products of greatest interest to the group. *Specific herb monographs *Combination products such as tinctures, capsules and teas *Optional: a brief on homeopathic galactogogues **Note: Ethics concerns are touched upon briefly. For a more in-depth discussion, pair this talk with the stand-alone Ethics session. What else is out there when the tried and true remedies don’t seem to be enough? This session takes a broad and open look at alternative and complementary therapies (ie, acupuncture, foods). Some have been studied formally while others are based on clinical experience and anecdotal reports. Interesting ideas and outcomes are discussed. For the professional who hates to leave any stone unturned. This session would benefit greatly from a generous allotted discussion time for participants to both discuss the merits of various ideas and also to share other ideas or insights. The connection between the thyroid gland and milk production has not been well-recognized or appreciated . The good news is that new animal research is providing us insights into the possible effects of thyroid dysfunction. This talk takes a detailed look at hypothyroidism, hyperthyroidism, postpartum thyroiditis and thyroid cancer and the unique challenges each present for lactation, and then discusses treatment strategies and interfacing with the health care team. Note: This is the most detailed version of this topic. PCOS is the leading cause of infertility in women and involves multiple possible hormonal imbalances. What has been learned about PCOS and breastfeeding? We will take a look at how the frequent problems of obesity, hyperandrogenism, insulin, thyroid and estrogen imbalances that may be part of a woman’s unique profile can impact the breastfeeding journey, then discuss potential treatments that are based on etiologies. Note: this overlaps with other hormone talks. Prolactin is considered to be a key hormone for lactation, yet our knoweldge has been surprisingly sparse. It’s necessary for pubertal and pregnancy mammary development as well as milk synthesis. While prolactin levels don’t correlate directly to milk production, lactation fails without it. This talk will take a closer look at current research and what we do and do not yet understand about prolactin. We will then examine specific cases and discuss the process of elimination, as well as possible strategies for affected clients. When a mother has struggled with chronic low milk production, sooner or later she begins to wonder about the next baby. Will this happen to me again? Is there anything I can do to increase my chance of more success the next time around? Should I even try breastfeeding again? Research suggests that mothers often do better with subsequent babies, but not all mothers wish to wait passively on the roll of the dice. For those who desire to be proactive, there often are concrete clues that can help paint a prognosis and lend guidance to future plans. This session will look at various scenarios of low milk supply and analyze potential variables that might be influenced in the future. Specific cases with varying outcomes will be presented, along with discussion on counseling challenges and helping mothers find emotional balance in the process. Hypoplastic Breast Syndrome (or IGT): The hot new diagnosis?